The Ruelco RD-1 is a normally open hydraulic controller that acts as a snap acting vent valve on loss of pilot pressure. 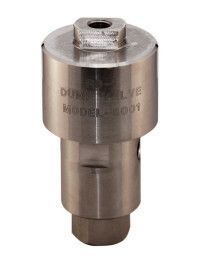 This configuration of the Ruelco RD-1 permits control of hydraulic pressure up to 10,000 PSI. A low pressure pilot supply is necessary to control 10,000 PSI of hydraulic pressure. 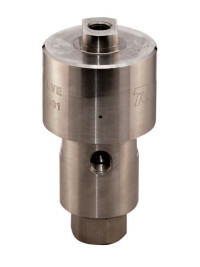 A high ratio of hydraulic pressure to pilot control pressure ensures safe operation. A soft seal design ensures zero leakage in the hydraulic section. The internal spring and the hydraulic pressure act on the spool area are jointly responsible for opening the valve, although each on its own provides sufficient force to open the valve. Ruggedly constructed stainless steel process wetted parts provide years of reliable service and the compact and simple design makes field maintenance easy. Large Cv factor ensures a fast system response. A low pressure pilot supply required to control 10,000 PSI.